Posted January 15th, 2019 at 9:36 AM (CST) by Bill Holter & filed under In The News. …because rates are so exorbitantly high! 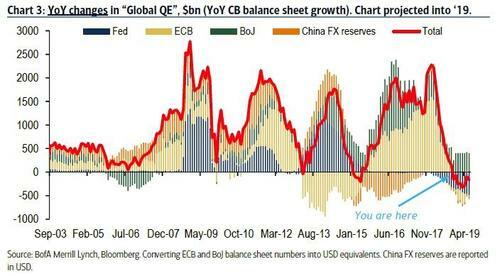 Global recession has arrived, any questions? Another way to visualize just the Fed’s balance sheet contraction is courtesy of this chart from Morgan Stanley which shows specifically which assets – Treasurys and MBS – are declining on a monthly basis.